Can anyone suggest a definitive answer for the origin of the word "teetotal" (teetotaler, teetotalism etc.)? The Wikipedia entry lists a few suggestions but I'm not sure which one to believe. "pledged to total abstinence from intoxicating drink," 1834, possibly formed from total (adj.) with a reduplication of the initial T- for emphasis (T-totally "totally," though not in an abstinence sense, is recorded in Kentucky dialect from 1832 and is possibly older in Irish-English). The use in temperance jargon was first noted September 1833 in a speech advocating total abstinence (from beer as well as wine and liquor) by Richard "Dicky" Turner, a working-man from Preston, England. Also said to have been introduced in 1827 in a New York temperance society which recorded a T after the signature of those who had pledged total abstinence, but contemporary evidence for this is wanting, and while Century Dictionary allows that "the word may have originated independently in the two countries," OED favors the British origin and ones that Webster (1847) calls teetotaler "a cant word formed in England." The OED Online entry ("not yet fully updated...first published 1911") for "teetotal, adj. and n." provides a lengthy etymological note. Some points made in that note remain good; other points can be contradicted with evidence now available from online reproductions of historical newspapers and journals. Etymology: A kind of emphasizing reduplication or extension of the word total adj. and n.
That 'teetotal' is formed as an "emphasizing reduplication" remains true. That "it was first used (in sense A. 1)...by a working man etc. ", while it may not be true, was not contradicted by any of the contemporary evidence I examined. ...It has been suggested that Turner only used a word colloquially current in Lancashire in the general sense A. 2 [dial. Absolute, complete, perfect, entire. (More emphatic than total.) Cf. teetotally adv.1. But to this the whole tenor of contemporary evidence is opposed: and the examples of tee-total in sense A. 2 in Eng. Dial. Dict. are all of much later date. The evidence I examined did strongly suggest that "Turner only used a word colloquially current in Lancashire", notwithstanding that attestation of tee-total in EDD is all from later than 1833. Even supposing it is not agreed that the now-contemporary evidence (presented next) strongly suggests "Turner only used a word colloquially current", the evidence now flatly contradicts what was undoubtedly true when published, that "the whole tenor of contemporary evidence is opposed" to the notion that Turner used a current colloquialism. Chester Chronicle (Cheshire, England), 07 September 1810. Waterford Chronicle (Waterford, Ireland), 23 February 1828. Dublin Evening Post, 27 November 1832. This article was also reprinted in the Newry Telegraph, 30 Nov 1832, and the Cork Constitution, 01 Dec 1832. Limerick Evening Post, 30 November 1832. Saunders's News-Letter, Dublin, 17 September 1832. It is evident from these uses that 'tee-total' and 'tee-totally' were colloquialisms in relatively common use, especially among the Irish, from 1810-1832. 'Tee-totally' particularly was likely to have been known to Turner before his September 1833 speech, as a result of the word having been widely disseminated in the article detailing the proceedings of the Irish Trades' Political Union, 25 Nov 1832, a scant ten months earlier. ...there is proof that the adverb tee-totally, as an emphasized form of totally, was used in U.S. in 1832, and it has also been said to have been common in Ireland from a much earlier date. Totally is much more frequent in colloquial use than total, and it is quite possible that it was strengthened to tee-totally much earlier, and that tee-total in the specific sense arose independently, and without any knowledge of the adverb. As shown by the clippings above, there is now proof that 'tee-totally' was used in Cheshire, England, as early as 1810. Preston, Turner's hometown in Lancashire, is a mere 44 m. (72 km) from Cheshire. 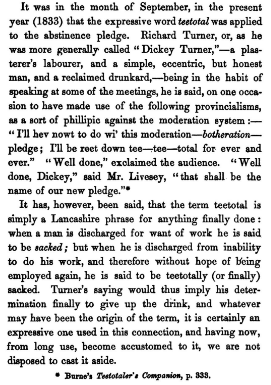 It has, however, been said, that the term teetotal is simply a Lancashire phrase for anything finally done: when a man is discharged for want of work he is said to be sacked ; but when he is discharged from inability to do his work, and therefore without hope of being employed again, he is said to be teetotally (or finally) sacked. 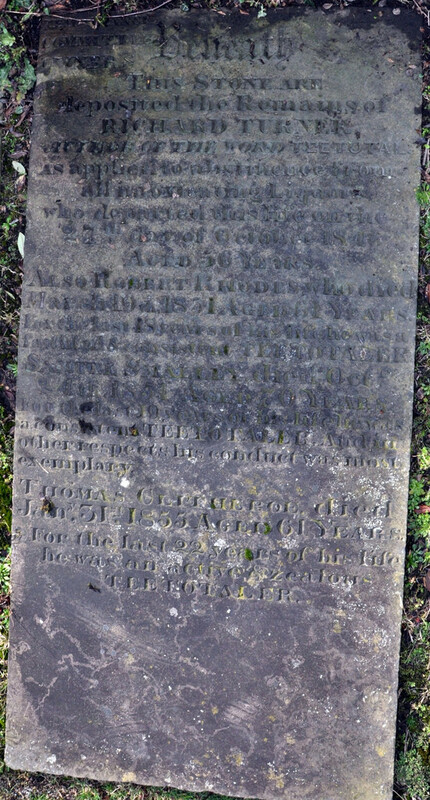 Beneath this stone are deposited the remains of Richard Turner, author of the word Teetotal as applied to abstinence from all intoxicating liquors, who departed this life on the 27th day of October, 1846, aged 56 years. Interestingly, the early useage of "tee-totally" was slightly pre-dated by a then familiar dicelike top called a tee-totum. Here, as well, the capital "T" on the tee-totum conveyed a very analogous meaning..."T", equivalent to a total win in finality. Could the familiarity of the tee-totum have influenced the later term? I suppose that explanation makes sense. It's an awkward construction, at least to modern American ears, but maybe it was like saying "total with a capital T". What is the etymology of “squiffy”?